Featured amenities include a 24-hour business center, complimentary newspapers in the lobby, and dry cleaning/laundry services. Planning an event in Volos? This hotel has facilities measuring 5059 square feet (470 square meters), including a conference center. Free self parking is available onsite. 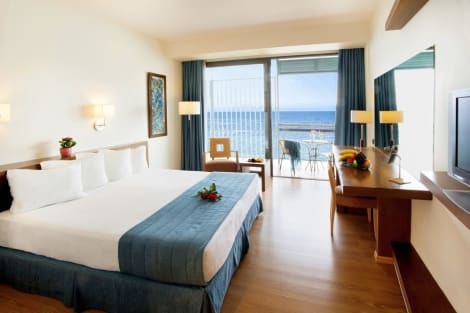 Make yourself at home in one of the 17 air-conditioned rooms featuring flat-screen televisions. Rooms have private furnished balconies or patios. Complimentary wireless Internet access keeps you connected, and digital programming is available for your entertainment. Private bathrooms have deep soaking bathtubs and hair dryers. With a stay at Hotel Argo in Volos (Volos City Centre), you'll be a 3-minute walk from Volos Port and 8 minutes by foot from Volos Town Hall. 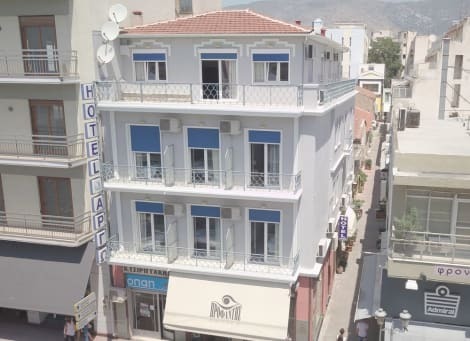 This hotel is 0.7 mi (1.1 km) from Volos Municipal Theatre and 1.2 mi (2 km) from Volos General Hospital. The comfortable Alexandros Hotel is centrally located in the city of Volos in Central Greece, just a few steps away from the harbourside. It features a number of services and amenities and offers guests easy access to the major shopping arcades as well as to the entertainment areas. Along the waterfront, guests will find many pastry shops, café-bars, restaurants and mezedopolia. The harbour area is also an important nightlife spot of the city. This hotel is an ideal starting place to discover Volos and the surrounding Pelion region. Make yourself at home in one of the 53 air-conditioned rooms featuring minibars and flat-screen televisions. Rooms have private balconies or patios. Complimentary wireless Internet access keeps you connected, and satellite programming is available for your entertainment. Private bathrooms with bathtubs or showers feature complimentary toiletries and hair dryers. Grab a bite from the snack bar/deli serving guests of Hotel Aegli. Wrap up your day with a drink at the bar/lounge. Buffet breakfasts are available daily for a fee. This charming hotel is in Volos. The premises count with 37 welcoming rooms. No pets are allowed on the premises. Enjoying lovely views over Pagasitikos Gulf, Park Hotel is located in the heart of the city of Volos, next to the municipal park. It offers a rooftop bar and elegant rooms with free Wi-Fi. All well-appointed rooms and suite are air-conditioned and include satellite TV and minibar. The rooftop bar enjoys an impressive view that overlooks the mountain of Pelion, the Pagasitikos Gulf and the city of Volos. American and Greek breakfast is served daily. Restaurants, bars as well as the commercial areas are only a stone's throw away from the hotel, while the beach is easy to reach on foot. lastminute.com has a fantastic range of hotels in Volos, with everything from cheap hotels to luxurious five star accommodation available. We like to live up to our last minute name so remember you can book any one of our excellent Volos hotels up until midnight and stay the same night.